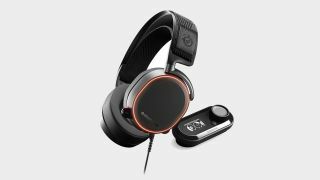 Get the Steelseries Arctis Pro + GameDAC for £150, £50 less than it's ever cost on Amazon. There are plenty of Black Friday gaming headset deals already—some that we know are starting later this week in both the US and UK, and some that have already begun. Today on Currys, UK readers can pick up what we've declared our best wired gaming headset for a huge £100 off: the Steelseries Arctis Pro + GameDAC. This beats its previous low price on Amazon of £197.90 by some distance. If you're looking for a slightly cheaper all-rounder, the Steelseries Arctis 7 is £90, too, which also made our best-of list. Here's what Phil Iwaniuk said about the Arctis Pro in his review back in September. "This wired Pro model isn’t the cream of the new Arctis crop—that honor belongs to the more expensive wireless version, which also includes a chat mix scroll wheel on the headset, and the ease of use that a wireless setup brings. But if your budget doesn’t stretch that extra $50, you won’t find a more complete package for 250 bucks."